Background: Optional. The clip to apply the lens flare over. Track: Optional. The lensflare hotspot is positioned on the brightest part of this image. If this input is not selected, the Background input (current layer) is also used for the tracking. Hotspot Threshold: Default: 0.6, Range: 0 or greater. Blur For Auto: Default: 0.056, Range: 0 or greater. The input is blurred by this amount before finding the brightest location. 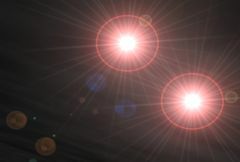 Rotates the ray elements of the lens flare, if any, in counter-clockwise degrees. Turns on or off the screen interface widget for adjusting the Scale Widths and Rel Heights parameters. Show Pivot: Check-box, Default: on. Turns on or off the screen user interface for adjusting the Pivot parameter.